As the Portland Diamond Project announces a location for the spot of an MLB ballpark (Terminal 2 at the Port of Portland), let’s take a look at why the City of Roses deserves baseball in the first place. As the largest city between San Francisco and Seattle, it seems only fitting that Portland finally gets the MLB team it’s longed for. With only a handful of other professional teams in the city, Portland was in dire need of a novel franchise that could captivate its booming population. While locals and newbies rage on about the benefits and drawbacks of a new potential team on the block, I’m here to settle the score. Portland deserves baseball—and here’s why. Portland and the surrounding townships of Beaverton and Hillsboro are the largest between San Francisco and Seattle, with an estimated population of approximately 4.2 million people. This statistic alone is significant, as it also makes Portland the largest city in the state of Oregon. Based on Census data from 2017, Portland saw approximately 578 new residents per week . Combine this population growth of 1.2 percent with that of Bend’s 3.4 percent growth and Prineville’s 3.5 percent growth, and it seems as if the state itself is bursting at the seams. People are moving here by the masses. Many newcomers arrive in PDX rooting for teams across the country, from Boston to Cleveland to Tampa. But an MLB team in Stumptown could change all that, as fans either adopt Portland’s club as their own, or instead turn out to games simply for the love of the sport. Off the bat (no pun intended), Portland presents itself as a location with the populace to sustain a team’s fanbase. Let’s consider the basic financial opportunities in Portland. With major brands the likes of Nike, Intel, Hydroflask, Fred Meyer, and Columbia Sportswear calling Oregon home, there are obvious potential sponsorships and commercial opportunities. Think of Nike branded gear, decaled Hydroflasks, and much more. But Portland may be known even more for its creative industry, as small business drives much of the city’s economy. Imagine having Blue Star Donuts and a Wanderlust IPA from Breakside Brewery when you go for a snack at the 7th inning stretch. It really doesn’t get much closer to heaven. 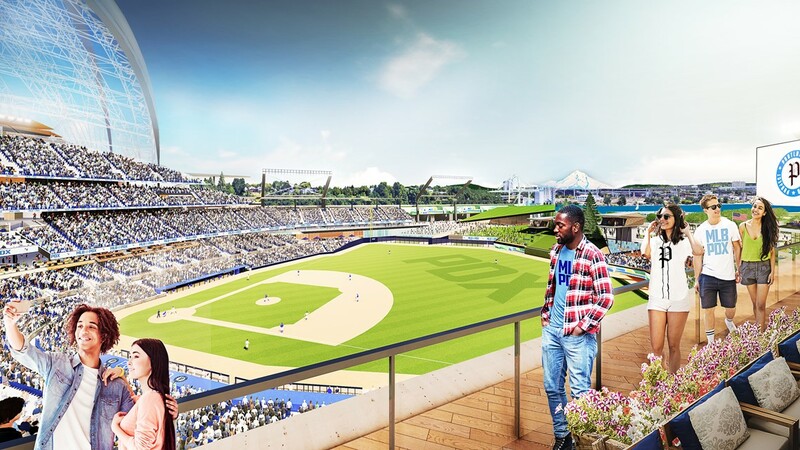 When the Portland Diamond Project began the journey to bring MLB to Portland, one promise was made: Portland would not devise a new funding source to build a stadium or secure a team. This means the city and its taxpayers will not be held responsible for the bill in this endeavor, as financial backers and investors take on the economic responsibilities. As a result, Portland has a major opportunity to benefit economically. To further drive home the point from before (pun intended), Portland has but three major sports teams. The Trail Blazers, Timbers, and Thorns have respected audiences and a cult-like following throughout the city. But at the end of the day, these teams represent only two professional sports in a diverse world of potential competition. For those who aren’t looking for a basketball game at the Moda Center or soccer game at Providence Park, you’re not left with many options. Roller derby or bike polo seem to be the only other alternatives. As the Timbers and Thorns are the only teams playing throughout the Summer—yet they only do so once per week, for half their games—an MLB team in Portland lends ample opportunity for sports fans to get out and cheer. At first I struggled to see commuting to the games as a positive. Coming in at #12 of the most congested cities in the country based on data from Stacker, Portland is a hot spot for traffic from Beaverton, the downtown PDX area, and Vancouver, Wash. I couldn’t imagine a scenario in which driving or taking the light rail to a game would be enjoyable. But then I began to consider the alternatives. As one of the friendliest cities in the country for biking, the idea of hopping on a two-wheeler and heading over to the stadium amongst a drove of fans sounds too good to pass up. Knowing Portland, if bikes are involved it’s bound to be a good time. When I originally drafted this article, I set out to explain why Portland didn’t deserve an MLB team. I credited poor weather, a weak fan base, unbearable traffic, and unsustainable growth as reasons why the city didn’t need Major League Baseball, much like I don’t think most cities need the Olympics. I was hellbent on shutting down the Portland Diamond Project and all they stood to gain. But as I delved further into that article, I struggled to find legitimate reasons illustrating why PDX could do without the MLB. I grew fond of the possibilities a major league team could bring. Growing up in Massachusetts and being raised as a Mets fan, I made infrequent three-hour trips to Citi Field in Queens and yearned for rare occasions when the Mets would visit Fenway in Boston. I remembered the atmosphere, the fans, the cheers, and the tears, all in vivid detail. While looking back on such glowing memories, a thought suddenly dawned on me: Why should Portland be deprived of such experiences? In truth, it shouldn’t. As the MLB looks to expand, some teams will relocate, and others will form from the ground up (MLB Commissioner Rob Manfred has even said Portland is on the short list for an expansion team). When the MLB comes to Portland, we’ll be ready—craft beer and all. And I’ll be right there in the stands with the rest of ‘em.